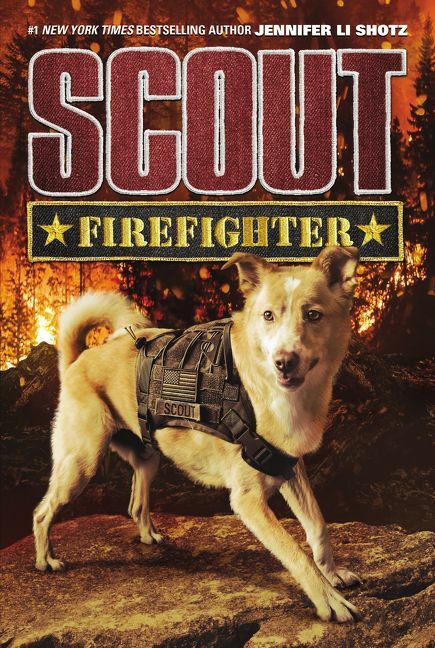 Newly inducted military rescue dog, Scout, returns for a second adventure where he and his human, Matt, must save their friends from a wild forest fire. The second installment of the action-packed Scout series, from the #1 New York Times bestselling author Jennifer Li Shotz. It’s official: Scout is now a K9 in the National Guard. But being a certified hero means Scout has his job cut out for him. He needs to work even harder to protect his country and his human best friend, Matt. When Matt’s classmates get trapped in a raging wildfire, Matt knows that only Scout can track them down and bring them back safely. But when Matt’s dad, a First Sergeant home on leave, gets wind of their plan, he insists on joining the rescue mission. Can the heroic team save Matt’s friends from the dangerous fires before time runs out? This fast-moving tale of Scout the hero dog will grab even reluctant readers and is perfect for fans of Cracker!, Max, and Hero.